The Butler baseball team cleaning up after a game. Collegian file photo. Before the first pitch. Before the lineups and national anthem. Before the fans eagerly pack the stands to watch Ryan Pepiot or Alyssa Graves pitch for the Butler Bulldogs, there must be groundskeeping. Butler’s baseball and softball fields must be in peak condition for a practice or game. But this isn’t the Southeastern Conference, the premier level for both collegiate baseball and softball. There is no 40-man groundskeeping crew like at the 2014 SEC baseball tournament. There is no “assistant director of sports turf operations” like at the University of Arkansas to ensure the field is playable. At smaller programs with significantly smaller budgets like Butler’s, baseball and softball teams must maintain their own fields. 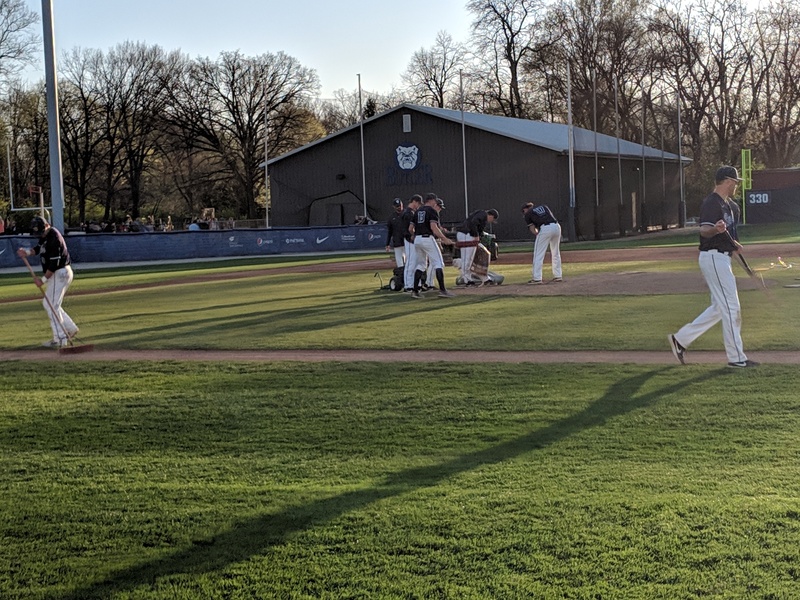 In a collective effort, the baseball coaches and players help maintain the mound and areas around the infield while a grounds crew maintains the outfield grass. The softball coaching staff does most of the work on their field. Both Butler baseball and softball could play three to four home games in one week if they are hosting a midweek affair plus a Big East series. This means the field must be treated before and after each of these games. Butler baseball has played 15 home games so far and have five still left on this year’s schedule. Butler softball has hosted seven games with four yet to go. After games and practices, there are divetts that form in the infield dirt in both softball and baseball. Those must be packed with clay and watered to ensure a smooth field of play whether the team is hosting a nonconference opponent like Eastern Illinois or a Big East conference opponent like St. John’s. The teams must also ensure the batter’s box is painted. The most important part for baseball and softball is the field plays well and plays consistent. Baseball coach Dave Schrage has already kickstarted a number of groundskeeping projects in his three years at the helm of the program. In the past, Butler’s bullpen was close to the team’s dugout along the third base line like most other stadiums. It has since been moved just outside the outfield fence. The infield grass has also been replaced since Schrage took over. In the summers when they’re not recruiting, the baseball coaching staff spends a good amount of time working on the field for the next season. Throughout the week, softball head coach Scott Hall will spend upwards of 10 to 15 hours preparing the infield for a game or practice during the season. This includes hanging the American flag and Butler softball flags from the pressbox and preparing bullpens for the games. Hall often arrives at the facility around 7:30 a.m. for a Big East doubleheader that starts at 12 p.m. Mowing and edging work gets done on Friday before. Weather, as with any outdoor facility, is the biggest factor in the groundskeeping. When there is rain, both softball and baseball players help roll out the tarps to keep the field dry. Pitchers will help protect the bullpens. Those that stay for even a few minutes after a softball or baseball matchup can see the team’s work in action. Just moments after the last out, the Bulldogs get to work on raking or spraying the infield. Hall is often seen, along with the help of student managers and pitching coach Stacey Goyette, raking the infield during a break in a game or in between games of a doubleheader. Schrage said he believes it’s about more than just making sure the field is up to par. “It gives the guys a little bit of feeling of ownership when they take care of the mound and makes them feel a little pride,” Schrage said. Much like when Schrage took over the baseball program, the softball facility’s field was in need of a remake when Hall was handed the keys nine years ago. He says the softball program has gotten several compliments about the facility over the years. Despite the knee-jerk reaction to say that freshmen or newcomers on the team are forced to do most of the work, Schrage says everyone on the team joins in. “Whether they’re juniors, freshmen or seniors, we’re all Bulldogs so everybody kind of chips in,” Schrage said. The softball team will play its next home game on April 17 at 4 p.m. against Eastern Illinois. After a weekend series at Xavier, the baseball team will return to Bulldog Park to face Northern Kentucky on April 23. Staff reporter Drew Sandifer also contributed to this story.